Medley — Works from the Collection at Espace Louis Vuitton Tokyo presents work by the French visual artist Bertrand Lavier (b.1949, Châtillon-sur-Seine). On display are seven paintings and sculptures by one of the most influential avant-garde artists of his generation. Since the late 1960s, Lavier has used a wide range of materials in a hybrid style combining painting with photography, painting with objects, sculpture with objects, objects with photography, and objects with sculpture. Lavier studied horticulture at the Ecole Nationale d’Horticulture, and his work frequently explores art and plant life. He is also known for his ongoing projects – working on several for decades at a time, he emphasizes the concept of the work-in-progress and freely experiments with place and order. One of Lavier’s most iconic works, Walt Disney Productions 1947-2013 N°2 (2013), is from a series inaugurated in 1984. Here he enlarges vignettes from a 1977 Walt Disney comic strip about Mickey and Minnie Mouse visiting a modern art gallery. 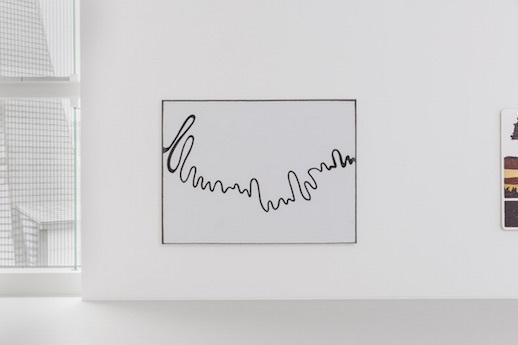 Abstract lines are painted on the canvas and enlarged into a presumed life-size format, depicting the connection of fiction and material reality. The relationship between art and reality is a common theme in Lavier’s work; it tends to transform everyday objects and recreate them in unexpected forms. This abstraction, combined with his eccentric humor, has become his signature style. Lavier’s presentations pose intellectually sophisticated visual puzzles that raise questions about perception. This ambiguity allows viewers to reassess the significance and the nature of the subject and observe relationships between art and life. Empress of India II (2005) uses neon tubes to recreate a painting from Frank Stella’s ‘Notched V’ series. While Stella intentionally avoided drastic changes in color intensity, Lavier takes a vividly pop approach. La Bocca (2005) is a lip-shaped sofa originally produced by Salvador Dali in 1970 with influence from the Dada and Surrealist movements. 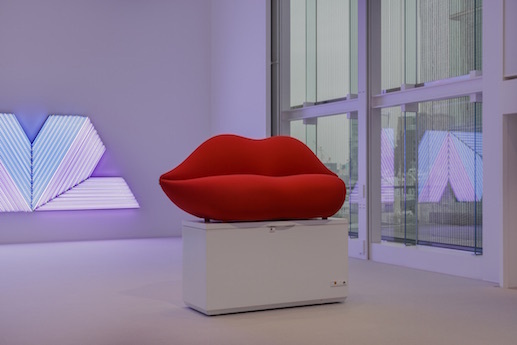 Lavier recreated the Bocca sofa for an exhibition at the Louvre Museum in Paris; it is one of his series of “demonstrations” in which he integrates two completely different objects that share no correlation to another. The unforeseen combination of sofa placed on top of a refrigerator reveals contrasts of hot and cold, heavy and light, and disrupts our ingrained visual habits. Lavier questions just what a sculpture is, juxtaposing the sofa’s roles as art and furniture piece. Lavier is an artist who captures the essence of previous artworks while repositioning and transforming them. He elaborates on two and three-dimensional pieces, taking them to another level physically and psychologically. He believes that the series he creates are constantly evolving. Having once said “chronology doesn’t count much with me,” Lavier clearly enjoys puzzling audiences by pushing boundaries beyond the unexpected.